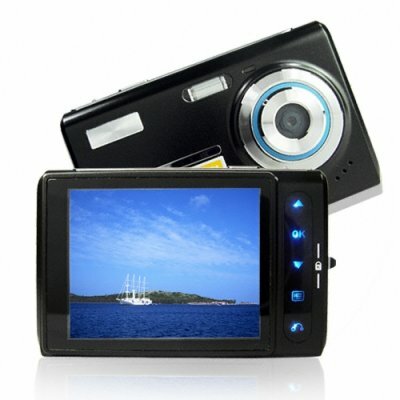 Successfully Added Touch Button Digital Camera - 5.0M Pixel Pictures to your Shopping Cart. Smooth 5.0 Mega Pixel Digital Camera, with a very cool and unique touch button interface for selecting menu options. Along with the touch button function, you are getting a very large 3.0 Inch LTPS TFT LCD Screen for colorful image previews, digital movie clips at 320x240 Pixels and 30fps, and USB2.0 and TV OUT for quickly connecting the Digital Camera to either a computer or a TV when you want to view your images. If you are looking for a great looking Digital Camera that is out of the ordinary, but still will take some really good pictures for you, this Wholesale Gadget Camera is one that will be sure to please. Note on Interpolation: Please note that this camera takes images in sizes equivalent to 12 megapixels. This is through a software resizing process on the camera called interpolation. The image sensor of this camera has a native resolution of 5 megapixels.